With more than 20 years experience of UV LED Curing process, DPL Provide High quality UV LED Curing system. How to design Cold UV curing Lamp? 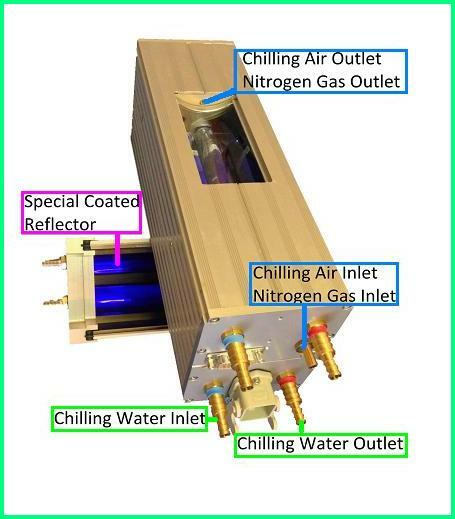 What is Cold UV curing system? Before we start to explain what is cold UV curing system, we have to explain some basic knowledge of UV curing technology. How does UV lamp work? According to the different application, there are several types of UV Lamp. For example, we can see many UV lamps when we visit emergency or operating room in hospitals. They are UVC lamp, which uses for disinfecting. UVC means the light wavelength from 100-280nm. For graphics printing and coating industry, we use kinds of Gas-discharge UV lamps or UV LED lamp. Gas-discharge lamps are a family of artificial light sources that generate light by sending an electric discharge through an ionized gas. For UV LED lamp, we will introduce later. As you know, UV lamp output includes 60% IR energy, a normal metal reflector reflects IR energy out of the lamp head/house, and heat up the touch temperature between your base material and lamp head. Every DPL lamp head/house use specially coated reflectors from the top frame to the two sides frame. These reflectors can absorb 90% IR from your lamp and transfer to the chilling system. Therefore, the surface temperature of your printing material is the only 5-10C degree higher than your environment temp. What is the advantage of Cold UV curing system? Besides of which we mentioned before, reduce UV curing temperature can help improving printing quality. Cold UV curing temperature can also help improving UV lamp bulb ‘s working lifetime. By our pattern design lamphouse, the general lifetime of our UV lamp bulb is over 2000 to 3000hours. On the other way, the lower curing temperature is good for curing UV lacquer on the thermal sensitive material. For example, even for printing base film as PET film, lower curing temperature will help improving printing accuracy. More information, welcome to watch our video. Previous Previous post: Why Choice DPL as your UV LED curing system supplier?